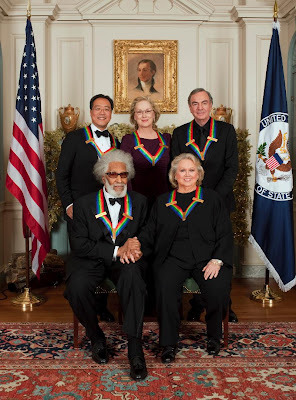 The Honors Gala will be broadcast on CBS on Tuesday, Dec. 27, at 9:00-11:00 pm (ET/PT). Rollins's segment was introduced by Bill Cosby. Musical director Christian McBride assembled an all-star band consisting of Rollins colleagues (and friends) Jim Hall, Benny Golson, Joe Lovano, Herbie Hancock, Jimmy Heath, Jack DeJohnette, Ravi Coltrane, Billy Drummond, and Roy Hargrove, who performed in different configurations before coming together for the finale of "St. Thomas." "It's about jazz music," Rollins said of the award's significance for him. "There are many people much greater than I am that were never honored in their lifetime, before honors like this were given out. I accept the award, but I accept it for the music, not so much for my own accomplishment." "There are many people in this room who could do this better than me: Jimmy Heath, Joe Lovano, Ravi Coltrane, Jim Hall. But it's appropriate because I'm just a fan. 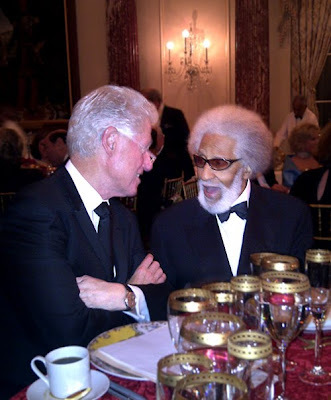 I discovered Sonny Rollins when I was about 15, 16 -- about 50 years ago. I loved jazz, and I fancied that someday I might be good enough to do it. And I bought my first Sonny Rollins LP. I listened and listened, I listened the grooves off of it. I subscribed to Down Beat magazine and I kept thinking: if I read every edition, sooner or later I will find one article that will explain to me what in the hell I just heard. It was unbelievable, and it still is. Decade after decade after decade, this man explores the far reaches of the possibilities of what has lovingly been called the devil's horn. His music can bend your mind, it can break your heart, and it can make you laugh out loud. Still today after all these years, if I wake up in kind of a bad humor, or I'm worried about something, if I put on Sonny Rollins's version of "Brown Skin Girl," I will laugh out loud. I have thought so much about his unique gifts. He has done things with improvisation that really no one has ever done. In complexity and creativity, he rivals Coltrane. On one of the three CDs I listened to to prepare my mind for this, the Road Shows 2 album [that] has a lot of the tracks from his 80th birthday concert at the Beacon Theatre in New York -- I was just aghast at how good he still is. There's a duet which is more of a duel with Ornette Coleman, who probably has the most extreme capacity to go beyond normal chord structures and tonal assumptions of any saxophone player. So Sonny just gets right out there with him. Then when he plays beautiful music-- Another one of the CDs I listened to today was called Old Flames. I played that one because it's a bunch of love songs that Sonny recorded in my first year as President. One of them, Duke Ellington's beautiful "Prelude to a Kiss," Jimmy Heath arranged and conducted. . . . It's so beautiful. And then I listened to The Freedom Suite, which he recorded almost 54 years ago, in February of 1958. A propos of what the former speaker said [referring to emcee Renee Fleming's earlier remark: "He'd take a song you'd known all your life and in soaring solos of improvisation strip away the familiar and reveal new universes of wonder"], there are also, at the end of The Freedom Suite, three different takes of "Till There Was You," and they're all different. This man is a marvel. He was born with a strong body and a brilliant mind and a passion for jazz. He knew when he made jazz his mistress he would never be bored, but he would never conquer. And he decided he would spend his life trying again, every single day. At 81, he told me tonight, he said "I still practice every day." Every day. I said, "I love that 80th birthday gig at the Beacon." He said, "I wasn't very good." Some musicians that are really good grace us because they keep playing. Sonny Rollins's great gift to all of us, whether you know a lick about jazz or not, is that he keeps growing. And he still does. A few weeks ago, physicists in Switzerland at the superconductor supercollider, the Hadron Supercollider, fired some subatomic particles called neutrinos through the mountains to a magnet in the Italian Alps, and it appeared that they arrived before they left. That is, it's the first known experiment in physics since Einstein propagated his theory of relativity where anything with matter and mass appeared to travel faster than the speed of light. People who know a lot more about this than I do are still trying to absorb what this means and whether the experiment is accurate. But if it is, it may mean not just that we don't know where we are and what time it is -- something I often feel when I'm in Washington -- it may mean that there is after all a whole fourth dimension to reality. Long before the scientists fired the neutrinos, Sonny Rollins believed there was another dimension to reality. In jazz music, his Mark VI Selmer tenor with his old Berg-Larsen mouthpiece is our superconducting supercollider. He has given us a gift, and reminded us that whatever hand we're given to play, we're supposed to play it to the very end and keep growing. Thank you, my friend."